This window is a memorial to Louise Highton who was a V.A.D nurse during the war and died aged just twenty. 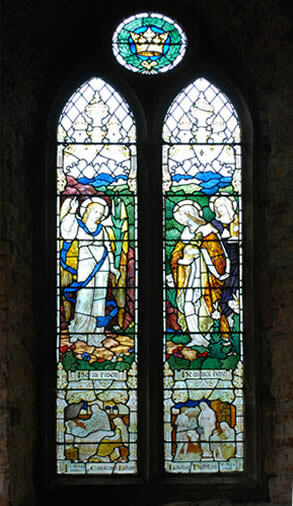 The window shows Mary Magdalen and Mary, Mother of Jesus, bringing spices to anoint the body of Jesus with the Angel telling them, “He is not here but Risen”. Florence Nightingale and Dorcas are depicted in the lower half tending the sick and clothing the needy. The last and one of the most beautiful of windows manufactured by Powells of Whitefriars for St John’s Church.